Mobile City has opened at 700 South Winchester Boulevard. 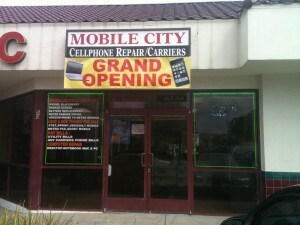 Mobile City sells a wide range of cell phones and accessories from manufacturers and brands such as Apple, Motorola, Blackberry and Samsung as well as repairing and unlocking phones. The spot was previously occupied by Premier, which moved to 534 Ramona Street in Palo Alto back in October, 2009. This entry was posted on Thursday, April 8th, 2010 at 6:33 pm by John Vink	and is filed under Uncategorized. You can follow any responses to this entry through the RSS 2.0 feed. You can leave a response, or trackback from your own site.